Could Claudio Ranieri be the miracle man once again? The 2015-2016 Premier League season showcased one of the greatest underdog stories in the contemporary history of football with Leicester City, the “5000/1 outsiders” at the beginning of the Premier League season, being crowned Champions of England. The mastermind behind it answers to the name Claudio Ranieri. The Italian coach who combined effective defence with accuracy on goal and prolific counter attacks took the Premier League by storm and pulled off a literal footballing miracle. His return to the league after his dream season with Leicester once again requires a miracle in order to save Fulham from relegation. Will he, however, pull it off once again? Fulham constitutes a peculiar case this season. Having bought a great deal of new players (jokingly crowned the champions of the transfer window), they never found the appropriate chemistry to edge matches. With the likes of players like Nice star Jean-Michail Seri, Besiktas keeper Fabricio and ex-Dortmund forward Andre Schürrle, few expected them to struggle. Nevertheless, coach Slavisa Jokanovic never managed to make it work in the top flight and at the time of his departure from the London club, Fulham had the worst defensive record in the league (31 goals in 12 games) and sat at the very end of the table. It is true that Fulham were never expected to be a tight side that would solely focus on keeping the clean sheet. Ever since Jokanovic took charge of the club, they had been an attacking team which did not mind conceding as long as they were scoring goals on the opposite end. Their stats last season demonstrate this style of play with Fulham conceding 46 times through the season. Thus, many of the millions spent to strengthen the team was aimed at the defensive line. The underperformance of the newly brought defenders such as Calum Chambers and Alfie Mawson is largely to blame for the club’s dreadful defensive record. Furthermore, the team largely relied on the 4-3-3 formation which while attractive in theory, will not be effective if a manager is relying on players such as Kevin McDonald that are not Premier League quality. Overall, while many disagreed with the board’s decision to oust the Serb arguing that he deserved more time to turn things around, it is clear that something was wrong with Fulham this season and a drastic change was required. Yet, to what extent is Ranieri the ideal man for the job? In the intervening period between his sacking from Leicester and arrival in London, the Italian coach managed French club Nantes, and while results were generally positive (Nantes finished 9th last year), a public fallout with the manager led to his departure. His acceptance of the job offer in London meant that he had to apply a total makeover to Fulham, in order to save the team from relegation, including the overall psychology of the team. As Fulham wonderkid Ryan Sessegnon spoke in an interview, Claudio Ranieri has placed extra emphasis on team bonding in order to bring back the positivity that accompanied Fulham in last year’s successful season. With regards to the tactical side of things, the coach mentioned in his first interview that he must “change things carefully”. His “I hope to play ugly and win” quote portrays the approach of the Italian to build a competitive team that while not as attractive to watch, will bring results. The 3-2 victory against Southampton in the first game he coached reminded everyone that “the miracle-man is back”. By putting the out-of-form Sessegnon in a much wider position and making Mitrovic believe in his goal-scoring abilities after a 585-minute goal drought, Ranieri helped his club put on an amazing display and take an essential victory in a thrilling match. Yet, the following three games produced some mixed results. While the defeat against Chelsea was an “expected” one, the disheartening appearance of Fulham in the most recent demolition by Manchester United (Fulham lost 4-1) brought clouds over the positive atmosphere created at the club. In the Manchester United post-match interview, Ranieri said that it was like there were “11 sheep vs 11 wolves” and his quote could not be more true. With 3-0 down at half-time, Fulham was pitiful and while the dominating performance by Man United did not help, Ranieri’s club went down quickly and easy. 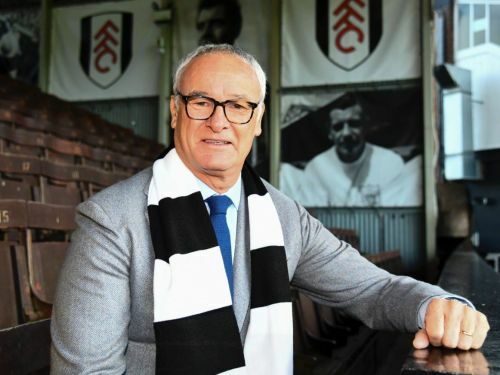 The mixed results inferred from Ranieri’s first 4 games as Fulham coach both with regards to the points gathered (4 in 4 games) and the club’s style of play, lead one to evaluate Ranieri’s ability to inflict long-term changes in Fulham to save the club from relegation. Many elements of the style of play that he solidified in Leicester are ideal for the struggling Fulham side. His belief that “defence starts higher up the pitch” and the quick transition from defence to attack that made players like Vardy and Mahrez shine 3 years ago, bodes well with Fulham’s pacey players with Sessegnon, Seri and Zambo-Anguissa being excellent for this style of play, especially against stronger sides. Furthermore, possession was one of the defining elements of the Jokanovic era in Fulham. By lowering the possession amounts and establishing a counter-attack system, Ranieri’s team will manage to concede less, of course very often at the expense of attractive football. Besides being an excellent technician, Ranieri has also proved very capable in inspiring players who are underperforming. His ability to boost player morale will definitely prove critical in a side that is blooming with quality yet lacks the results and optimism. Elements of his skill have already been established, with Mitrovic ending his goal drought in the first match of Ranieri as manager, leading his side to victory with 2 goals. Overall, even a man like Ranieri, who appears destined for impossible missions will find the critical situation in Fulham difficult to overturn. Yet, his first 4 matches in charge have shown that he is willing to work hard even though it will probably take some time for the players to adjust to his philosophy. Thus, while it would not be wise to start betting in favour of Fulham winning the Premier League, his track record of getting the best out of players and excelling under pressure will bode well for the London club which has the quality but lacks the momentum and a tactician to make the players shine. Premier League 2018/19: Where did it all go wrong for Fulham?